Sharp Apple AirPrint is a solution that allows you to print to AirPrint enabled printers directly from your Apple devices without installing any drivers or software packages. It’s like magic! AirPrint to Sharp printers with iPhone / iPad / iPod touch / and Mac OSX computers. 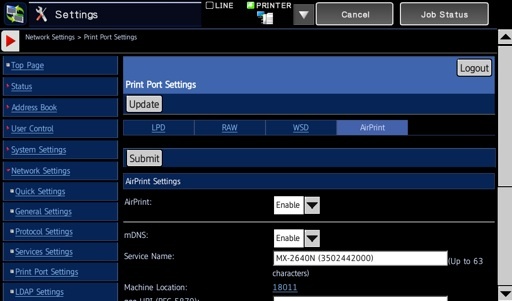 Contact Skelton Business Equipment to update your firmware if you do not have the option for AirPrint illustrated below in step 5. Using your AirPrint compatible device, open the document, email or picture you’d like to print. Touch the button that looks like the image below to open the Print menu, then touch Print, select your printer, adjust properties, touch Print. At this point you can AirPrint to your Sharp printer! Sometimes it takes a minute for the file to spool from your phone to the printer, this is normal. Just be patient and appreciate how simple the process is! Enjoy. Skelton Business Equipment is the premier Sharp copier dealer in Houston, TX. Call us today at 281-351-5128 or request a quote on an AirPrint compatible Sharp MFP. We offer free delivery, installation, training, networking for printing/scanning, free overnight toner shipment, and many more convenient services. There is a reason we have been around since 1979! We take care of our customers and they never go anywhere else to look for a copier in Houston! Can a Sharp printer model ( MX C401 ) be paired to an iPhone 7s. Sorry for the delay – No, the MX-C401 cannot be paired to an iphone, however there are devices you can purchase that will turn any network printer into an airprint capable printer. Look at the Lantronix X Print Server. It’s plug and play. My iphone and ipad will only print photos in black and white when airprinting to our Sharp MX3070. Android phone devices will print in colour no problem. Any thoughts on the reason why Apple has this problem? Thanks. There is a toggle switch that changes it to print color, also 2 sided or single sided. What model do you have? and what’s the firmware version? Double tap the little house button to see the firmware version in the bottom-right corner. Justin, you should have AirPrint, but it might not be enabled. 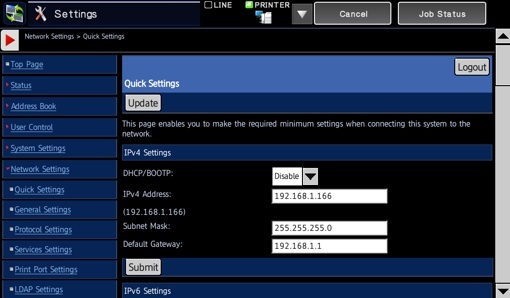 Go to the web page of the copier and click Network settings, login as administrator, then click Print Port Settings on the left menu under network settings. Go to the AirPrint tab and enable AirPrint, then click Submit. There is a version 6.0 that your local dealer should be able to install for you. Good luck. Sharp MX-2614N has working Airprint? If it no at this time, when releasing firmware this feature? I am not familiar with this model. If it’s similar to the MX2615N listed on our site then it does not have AirPrint, and probably wont have it in the future, unfortunately. Thank you very much 4 the response! Can the MX 3640 work airprint from my iphone, ipad and chrombooks? Yes. They released AirPrint capability after this model came out, so it might need a firmware update, but it is definitely capable of AirPrint. You’ll need to be on the same network as the printer for it to work properly. Can’t Air Print with USer codes enabled. Its asking for a username and a password when i try to air print. I sent you a private email that should help you resolve this matter. I sent you a private message that will help you resolve this issue. We have the same issue, is there a resolution for this? is it possible to airprint to the mx-2630 please? 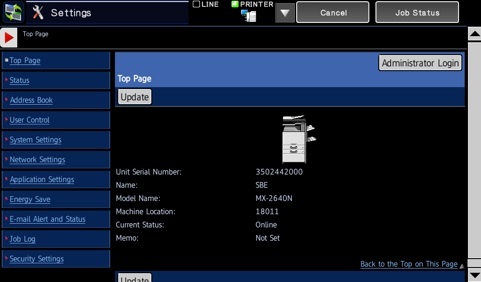 Yes, the Sharp MX-2630N has AirPrint standard. Can a Sharp MX-C300W have airprint capability? Can the Sharp Model MX-5112n use AirPrint? if so, why is the airprint tab not there? 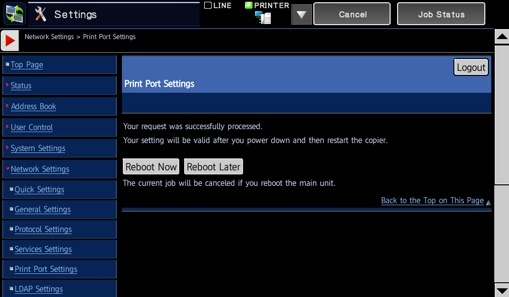 Will the printer require a software update? That model is not capable of airprint. 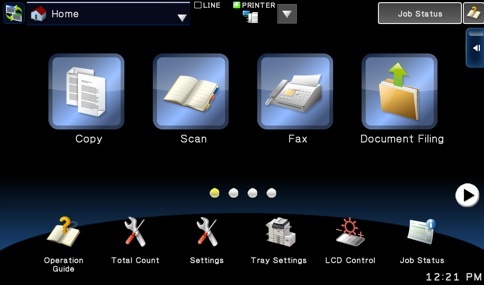 You can always purchase a Lantronix xPrintServer to make any netowrk printer AirPrint capable. On MX-2630 (or any essential series) does the MFP require a PS3 Kit for Apple AirPrint to work? Yes, the machine must have the Post Script in order to enable AirPrint. We have a mx2070n and I am the only one who can AirPrint in the office. The printer won’t show up on anyone else’s phone except mine even though we’re all on the same network. Any ideas to get everybody up and running? Unfortunately the new Apple update threw a lot of people who were capable of airprinting to not being able to, and I do not have a solution just yet. Thanks! I’ll keep following and let them know. I’m probably the only one that hasn’t done the last update. IM still using 11.4 on my phone. One person is running the latest version but some of the others still haven’t updated but I don’t know what version they’re using. Most of the trouble recently has come from the 12.0 update. I’ve tried troubleshooting but I’ve come up empty handed, and Sharp doesn’t have much documentation for troubleshooting AirPrint on our devices.